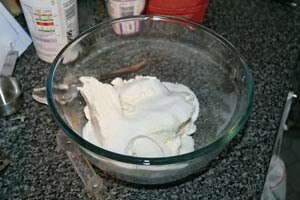 It was my birthday this week and what better way is there to celebrate this occasion then by making a devilishly decadent cake. 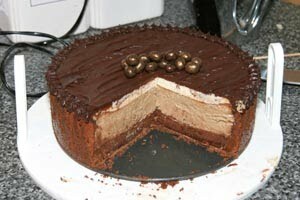 A Cappuccion Fudge Cheesecake to be precise. I originally saw this recipe on one of my favourite Blogs Smitten Kitchen a few months ago, and I have been waiting for an excuse to make it ever since. I had considered just making it with no special occasion in mind but I could not find a way to justify the construction of a cheesecake that uses 4 tubs of cream cheese and almost 1kg of chocolate without a very good reason. So along came my birthday and with the prefectly good reason of having to bring the traditional cake into the office, I decided on this bohemoth of a cheesecake. 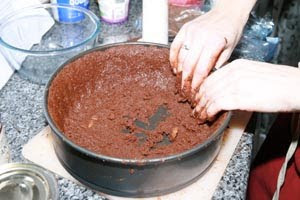 I encountered a slight problem in the first instance as I could not find chocolate wafer biscuits which the recipe calls for to make the cheesecake crust. So I improvised and chose another biscuit but it was one that seemed a rather different consistency so I had to use a bit more biscuit than the prescribed biscuit to chocolate ratio, but it turned out tasty, if somewhat sticky. 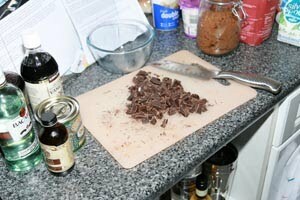 The hardest part was chopping all 800g of the chocoalte! 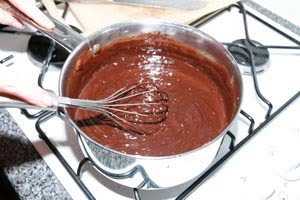 (Some for the base and the rest for the ganache) I’m sure I ended up with knife-blisters, so you may want to use your food-processor for that part. 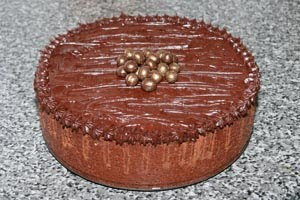 Making the Ganache to fill the bottom of the base was quick and easy after the mountain of chocolate had been chopped. It was rich and dark and utterley delicious, and gave me some indication of how rich this cake would be once fully constructed! While the ganache-filled base was chilling I whipped up the cream cheese filling. This took no less than 3 and a half tubs of full fat delicious cream cheese. Once this was combined with the rum and coffee it turned a pale shade of gold and smelled absolutley divine! 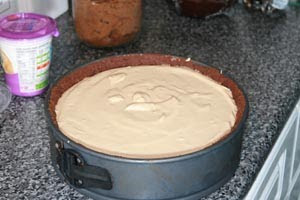 I was slightly panicked when the filling came so high up the tin. I was certain I’d never fit the last layer in, but the recipe did say to expect this so I took a deep breath and tried not to panic. 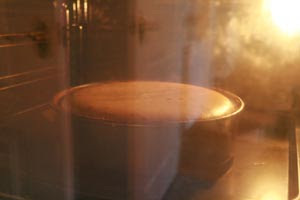 I did panic a little again when the cheesecake puffed up well over 2cm above the ende of the base while cooking. I know that this is fairly common and they do sink down again once taken out of the oven, but it looked somewhat terrifying if just for the fact that I knew I’d have to get another layer in there and then decorate it! The cheesecake did sink down again but I had to leave it out of the oven for a lot longer than the recipe’s stated 15 minutes before there was space for me to add the sour cream layer, but all was not lost and it worked out. Unfortuantely my sour cream layer bubbled around the edges while in the oven and subsequently did not look very pretty when it came out and had cooled. It rather resembled the surface of a cheese-moon. So in order to make it pretty again I used all the reserved ganache as a spread-over-the-top final layer and it turned out beautifully. Pretty and gorgeous and it certainly earned a lot of oohs and aahs when I brought it in to the office yesterday. I will certainly make it again, but I may have to wait until my next birthday as it is so rich that I am still trying to recover from the slice I had yesterday, and I will most certainly have to run at least 10kms to work off the billions of calories.